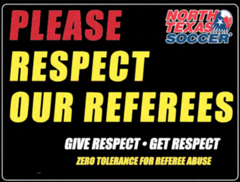 • The Respect Our Referees (RoR) program is designed to reduce verbal abuse, physical abuse and inappropriate / unacceptable behavior involving soccer referees. • It is designed to positively influence behavior around the soccer pitch. • The goal is to provide a fair, safe and enjoyable environment for everyone involved; players, coaches, spectators and referees.